This book is the fascinating true-life story of a father who had no western education yet strived so hard to ensure that his children got the education which he so much desired but never obtained. It also captures the inspiring account of how a child abused by foster parents turned out to be an award winning lecturer. “The book has been crafted in such a manner that, whoever picks it to read will not put it down until he/she has gone through it, cover to cover. This is so because each page is ‘spiced’ with words of wisdom, proverbs, advice and how Nigeria ‘works’…… It is both a fruitful source of inspiration as well as a book of ‘lessons’ to everybody.” Professor Abdullahi Mahadi, CON Former Vice Chancellor, Ahmadu Bello University, Zaria and President, The Mahadi Foundation “I have gone through your book and I must confess that I am highly impressed and very appreciative of your contributions to humanity. Your reading habit, knowledge and experience as epitomized in this book are, to say the least, fantastic.” Abubakar B. Jauro, OON Retired Federal Permanent Secretary & Former Secretary-INEC “Well written, entertaining and interesting autobiography…” Editor’s comment THE AUTHOR Dr. Mohammed Bukar, an associate professor, with the College of Medical Sciences, University of Maiduguri, started his academic career in October 2007. He got two accelerated promotions, first to senior lecturer in 2009 and to associate professor in 2011. He had his residency training in Obstetrics and Gynaecology at the Federal Medical Centre, Gombe. He is a prolific writer with over seventy publications in peer-reviewed local and international journals. Among the awards he has received are: NYSC state merit award, Kogi State 1997; best senior staff award in Obstetrics and Gynaecology, Federal Medical Centre Gombe, 2004; favourite lecturer award, MBBS/BDS graduating class of 2010, University of Maiduguri; best lecturer award MBBS/BDS graduating class of 2011, University of Maiduguri; Outstanding lecturer award, MBBS/BDS graduating class of 2014, University of Maiduguri. He is at present a Member of the Faculty board and examiner in Obstetrics and Gynaecology of the National Postgraduate Medical College of Nigeria. He is also the deputy provost, clinical, College of Medical Sciences, University of Maiduguri. Dr. Mohammed Bukar is the author of Recipe for Successful Residency Training. 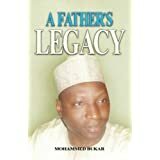 A Father's Legacy depicts the journey of Mohammed and his unique life in Nigeria. As a child he endured physical stress from a family that fostered him. He became very ill, leading to academic setbacks. His persistence eventually lead him to further success. His parents played a key role in researching and helping their son graduate college. Many other people sponsored Mohammed, and he was very grateful. Financial institutions, and the culture are very different. Eventually he was able to help others along the way. He provided medical aide and modern medicine. His childhood experiences molded his legacy and success. I realized I am very thankful for all the modern conveniences we use daily. I give this book three stars. Thank you for sharing your story. I received this book in exchange for an honest review.